Bosc is a cultivar of the European pear that is grown mainly in the northwest of the United States. It is named for French horticulturist Louis Bosc. The cultivar originated in Belgium or France in the early 19th century. The Bosc is that pear with a skin the color of a potato, with a long neck. The verb “to vet” comes from the term “veterinarian”. The idea is that to vet something is to subject it to careful examination, like a veterinarian checking out an animal. McDonald’s offered Chicken McBites in the US North American market in the early 2010s. McBites were made from small pieces of chicken breast. The word “gondola” was originally limited to the famous boats that travel along the canals of Venice. When man started to fly through the air in hot air balloons, “gondola” was used for the basket in which the passenger(s) traveled. By extension, the structure carrying passengers and crew under an airship is also called a gondola, as are the cars suspended from a cable at a ski resort. “Lady and the Tramp” is a classic animated feature from Walt Disney, released in 1955. The title characters are a female American cocker spaniel and a male stray mutt. Who can forget the scene where the Tramp and Lady are “on a date”, and together eat that one strand of spaghetti? So cute! “Rage Over a Lost Penny, Vented in a Caprice” is a piano rondo by Ludwig Van Beethoven. The piece was originally called Rondo Alla in Grecia Casa Capriccio by the composer, but somebody else wrote the whimsical title on the original autograph manuscript. The latter title is the name under which the work is best known. The Han River that runs through the South Korean capital of Seoul used to be known as the Hanshui, a name that is still used at times today. The Silk Road was a network of trading routes that crossed North Africa and Asia, connecting Europe to West Asia. The routes get the name from the lucrative trade in silk from China. The Gauls were a Celtic race, with Gaul covering what is now known as France and Belgium. We use the term “Gallic” today, when we refer to something pertaining to France or the French. Lara Croft was introduced to the world in 1996 as the main character in a pretty cool video game (or so I thought, back then) called “Tomb Raider”. Lara Croft moved to the big screen in 2001 and 2003, in two pretty awful movie adaptations of the game’s storyline. Angelina Jolie played Croft, and she did a very energetic job. The Ladies Professional Golf Association (LPGA) was founded in 1950 by a group of 13 lady golfers, and today it is the oldest ongoing women’s sports professional organization in the US. The Golden State Warriors are our local NBA franchise out here in the San Francisco Bay Area and are based in Oakland, California. The team was founded in 1946 as the Philadelphia Warriors, becoming the San Francisco Warriors when they moved to City by the Bay in 1962. They changed named again (to Golden State) when they relocated to Oakland in 1971. The statewide name reflected the fact that the team played some of their 1971-72 season games in San Diego, and as such were “California’s” team. Chechnya is a federal subject of Russia located in the North Caucasus in the very southwest of the country. The capital of Chechnya is Grozny. In the days of the USSR, Chechnya was part of the Chechen-Ingush Autonomous Soviet Socialist Republic (ASSR). The former ASSR was subsequently divided into the Chechen Republic and the Republic of Ingushetia. The Chechen Republic declared independence from the Russian Federation, which resulted in the First Chechen War, fought from 1994 to 1996. Boris Yeltsin’s government in Moscow signed a peace treaty ending the war and ceding autonomy to Chechnya. However, Chechnya-based Islamic fighters invaded Dagestan in 1999, at which point Russian troops entered Chechnya again, starting the Second Chechen War. The second conflict raged until 2009, when the Russians withdrew many of their troops having severely disabled the capabilities of the Chechen separatists. The Totino’s brand of frozen pizza was founded by Rose and Jim Totino, a married couple who had been running a take-out pizzeria in Minneapolis since 1951. A small percentage of lions are white in color due to a rare genetic mutation. Starting in the 1970s, the rare white lions were removed from the wild and sent to zoos and circuses for breeding. There hasn’t been a spotting of a wild white lion since 1994. Trinidad and Tobago is a republic in the southern Caribbean that largely comprises the two main islands of Trinidad and Tobago. The city of London, Ontario lies about halfway between Detroit, Michigan and Toronto, Ontario. Just like the city’s better known namesake in England, Canada’s London is located on the Thames River. Gaius Octavius Thurinus (often called Octavian) was the adopted son of Gaius Julius Caesar. After Julius Caesar was assassinated, Octavian came to power in Rome and teamed up with Mark Antony and Marcus Aemilius Lepidus in what was called the Second Triumvirate. When the triumvirate fell apart, especially after Antony’s defeat at Actium, Octavian became more powerful within the Roman Republic. Several years later he wrested sufficient power from the Roman Senate to end the Republic and begin the Roman Empire. As the first Emperor of Rome, Octavian was given the name Caesar Augustus. The month of August, originally called “Sextilis” in Latin, was renamed in honor of Augustus. A riser is a platform that elevates a group of people above a crowd, and so is ideal for the performance of a choir. When President George W. Bush appointed Elaine Chao as Secretary of Labor, he made a bit of history as Chao became the first Chinese American in history to hold a cabinet post. It turned out that Chao became the only cabinet member to hold her post for President Bush’s full eight years in office. In 1993, Chao married Mitch McConnell, the Republican Leader of the US Senate. The “Iowa State Daily” is a newspaper serving the students of Iowa State University in the city of Ames. The publication was founded way back in 1890 as the “I.A.C. Student”. “I.A.C.” stood for “Iowa Agricultural College”, the name of the university at that time. The International Monetary Fund (IMF) was established at the end of 1945 with 29 major economies supporting and funding an effort to stabilize economies across the globe after WWII. Headquartered in Washington, D.C., today the IMF has 187 member countries. LAT: 19:16, no errors; what Mary said. WSJ: 26:46, no errors; several missteps. Newsday: 45:36, no errors; thoughtful but straightforward. I did all three of these yesterday after undergoing a certain procedure with which the old folks here are undoubtedly familiar. Suffice it to say that my day began with a massive headache due to a lack of alimental sustenance and ended with some truly astonishing episodes of borborygmus. 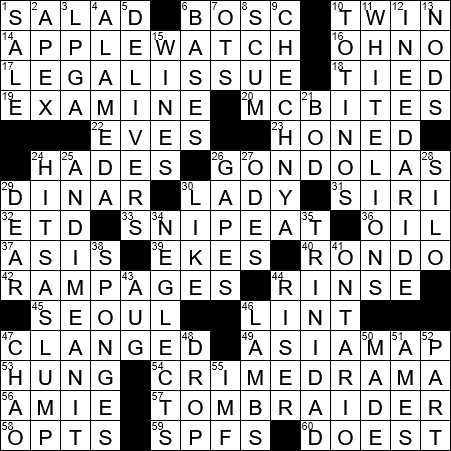 Borborygmus: now there’s a word that deserves to appear more often in crossword puzzles! And, if Ogden Nash were still at large in this vale of tears, he would no doubt enshrine the plural in a poem, rhyming it with “pygmy”. But I digress … 😜. You got it … 😜. LAT: 13:51, no errors. WSJ: 24:25, 2 errors, one on a weird Naticky corner (30A-15D). NYT# 1229 from my paper today. 44:22 with one very dumb error. For me a good Saturday . To anyone I still don’t understand, even with Bills explanation , makes out too much, say which equals I hit a slump. TYIA. Hi Sallee. Think of baseball and making out too much when trying to get a hit. You would be in a classic hitters slump. I didn’t get it either. And why would anyone outside of California know which county the GS Warriors play in? I did, being a basketball fan, and having visited California in the past. One of those tidbits of trivia I knew. But I didn’t care for this cw very much. Bill- I thought same thing, on Last Supper, and I did misread gaelic – gallic. Time for new glasses. DNF which is usually the case on Saturday. @Vidwan – I was anonymous on Thursday – not on purpose. It was -1 this a m but is now up to +20. Utica gets these. I don’t think my son in Tulsa misses this, but maybe the beautiful snow. He was one of those young men who wore “a parka and shorts” in the Winter, which is supposed to be a sign that you’re from Upstate NY. 26 mins, 5 sec, no errors. Grateful to finish this Burnikel grid. It was tough, especially the middle west quadrant. Changed fills any number of times trying to make it all work. C.C. has baseball on her mind, and a couple of real ballpark posers to prove it. DaVinci’s Last Supper was a mural composed of tempura paint with gesso. Thank you A.L., I didn’t think it was an oil painting. Bill’s explanation of OIL for Last Supper is blank as I am looking at this on Sunday. Did he originally have an explanation which was deleted after the observation by A.L.? Yes – C.C. is obviously a sports fan so I like that she incorporates a lot of that into her puzzles. Mostly easy Saturday for me; took about an hour with 3 errors. Had LADi, ETa and RA_PAGES, since I couldn’t figure out 25 down. I got bored after an hour and called it a day. Most of the rest was tricky but fun. I’m getting the impression that CC is Korean -American, lives in Minnesota and likes baseball, Winterports and animated movies. Hey dirk!! You’re on track re Ms Burnikel (just googled her.) She does live in Minnesota! — and she describes where she lives as “Twins district ” or something along those lines. But she’s from China, not of Korean heritage. amazing, do you really like crossword?